Strawberries will be in season before you know it so it’s time to start gathering your strawberry recipes. American’s favorite berry isn’t just a sweet, juicy treat — they’re also incredibly healthy. 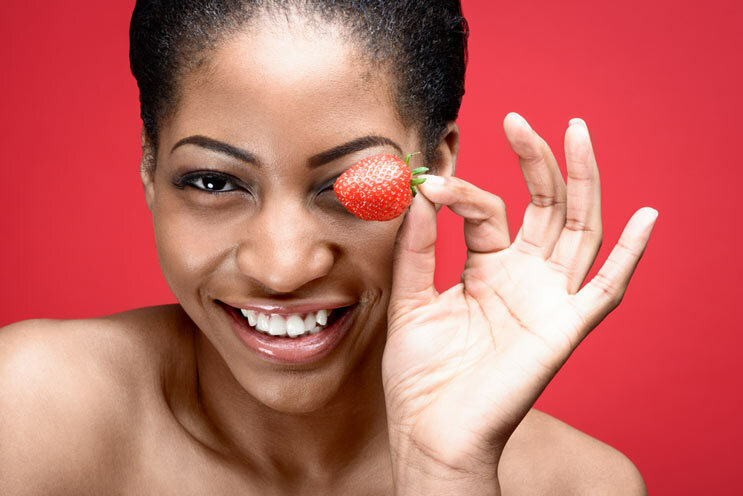 They’re naturally low-cal as well as loaded with vitamin C and fiber so as long as you don’t add tons of sugar, strawberry desserts are guilt-free pleasures. Here are 10 strawberry recipes to showcase springtime flavors. 1. The Best Strawberry Pizza It lives up to its name — this Strawberry Pizza is one of the best strawberry desserts ever. A made-from-scratch sugar cookie crust layered with honey-sweetened goat cheese and sliced fresh strawberries. 2. 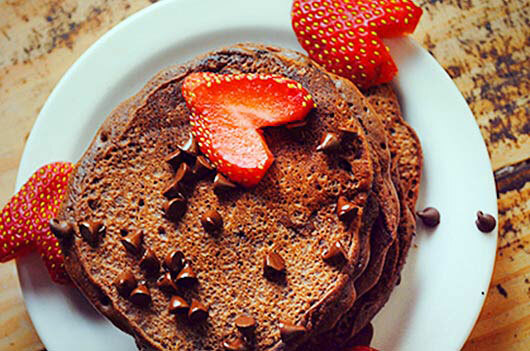 Chocolate Strawberry Pancakes Chocolate Strawberry Pancakes are the perfect Sunday treat and this recipe is so easy that the kids can make it for you! 3. Strawberry Shortcake Cookie Cups Whip up a batch of these for your first spring party. They’re a fresh, airy bite of heaven. 4. 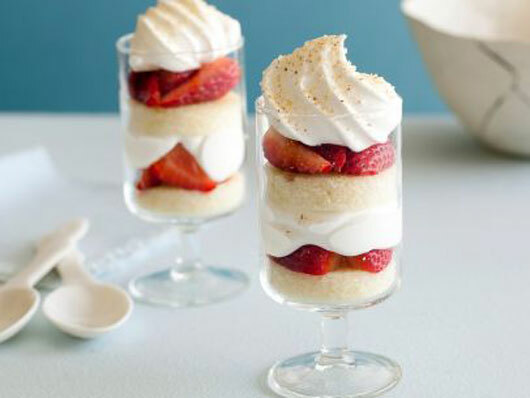 Individual Strawberry Trifles Strawberry Trifle is so light and fluffy, it just looks like springtime. Giada De Laurentiis cuts the sweetness by marinating fresh strawberries in balsamic vinegar and adding a dash of amaretto. 5. Festive Strawberry Tamales If you love tamales (and who doesn’t?) then you’ll go crazy for these Strawberry Tamales. They make a delicious dessert or snack on the go. 6. 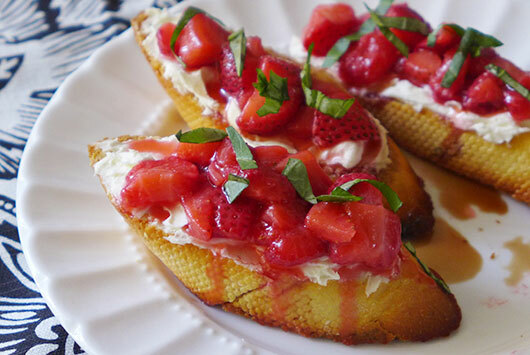 Grilled Strawberry Basil Bruschetta Here’s a sweet and savory springtime appetizer that blends the sweetness of warm strawberries with mascarpone and basil. They’re not just delicious, they make a gorgeous plate. 7. Easter Egg Chocolate Covered Strawberries Here’s one of our favorite strawberry recipes. It’s super easy and they look phenomenal. All you need are fresh strawberries, white melting chocolate and food coloring. 8. 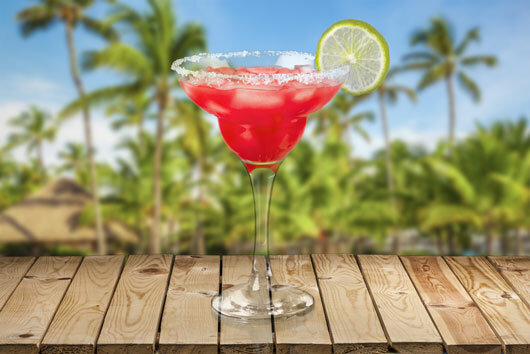 Strawberry Margarita Make Guy Fieri’s easy Strawberry Margarita your official spring cocktail. The sweetness of fresh strawberry puree perfectly offsets the musky tequila kick. 9. Skinny Crunchy Stuffed French Toast This is a nutritious take on a decadent breakfast food, with whole grain toast, low-fat cream cheese and fresh strawberries. They’ve got less than 10 grams of fat and under 300 calories per serving. 10. Strawberry Crumb Bars Fresh berries demand at least one crumble recipe and these Strawberry Crumb Bars are divine.